Adam Reed Tucker shows off his LEGO creations. Trained architect Adam Reed Tucker has recreated some of architecture's most famous structures -- in LEGO form. And this Saturday, his creations made from items from our childhood go on display in a new exhibit called LEGO: Architecture Towering Ambition at the National Building Museum. 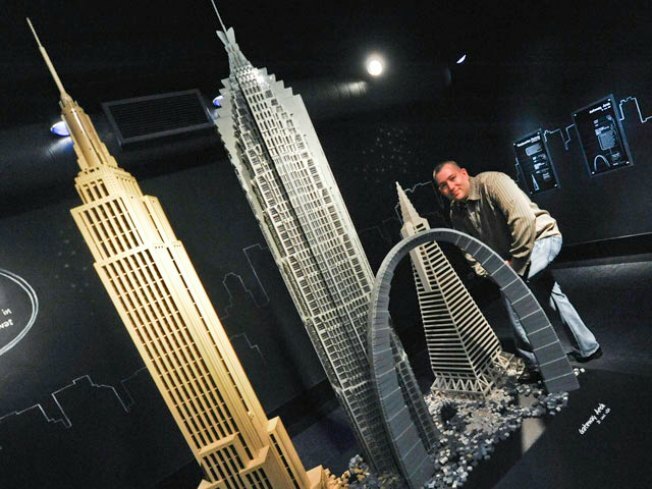 The exhibit showcases 15 buildings from around the world made entirely from LEGO bricks. But this is no child's play. Some of the world’s most famous buildings will be included in the exhibit, such as the Empire State Building, the St. Louis Gateway Arch and a recreation of Frank Lloyd Wright’s masterpiece, Fallingwater. As an added bonus, Tucker -- one of only 11 LEGO Certified Professionals in the world -- will be on hand at the NBM to work on his latest LEGO creation -- the White House. Visitors will have a chance to explore the breathtaking structures and are encouraged to build their own that will be included in a LEGO city. As the days go on and the museum welcomes more visitors, the LEGO city will grow larger with the models made from each individual visitor. This exhibit allows LEGO lovers to participate in fun-filled activities and build their own models. Admission is only $5 per person and children ages three and under get in free. And here's a hint: the first Tuesday of every month is free. The LEGO: Architecture Towering Ambition will be at the National Building Museum from July 3-Sept. 5. For more information visit NBM.org.